Tangential fans contribute to rationalization and efficiency in industrial applications due to their various technical advantages, above all the uniform airflow over large areas even with wider machines or conveyor systems. They provide effective cooling, heating or drying and assure a flawless function and quality improvement of machinery and equipment. 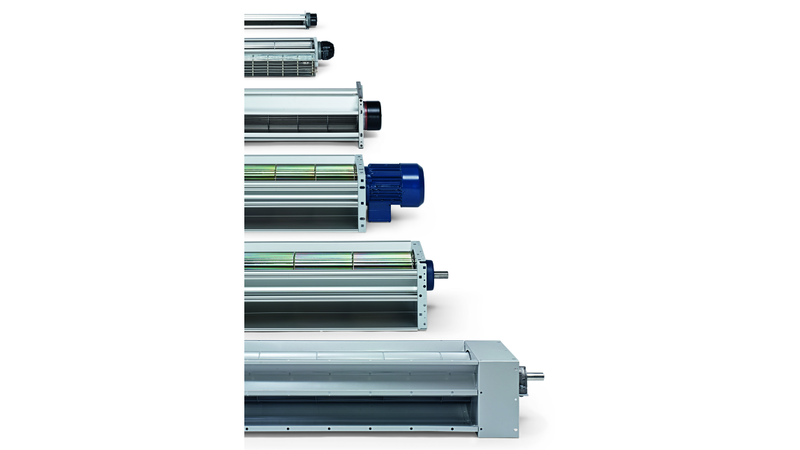 By precise adaptation of the fan length to the machine width, space-saving installation through 90° or 180° airflow deflection in any mounting position, as well as optional positioning of the drive on the right or left hand side, the applications of tangential fans are extremely flexible. They can even be used under extreme conditions with a wide temperature range from -180 °C to +800 °C and explosion-proof versions according to ATEX. Their streamlined impeller and housing geometry makes them particularly quiet. The sturdy construction and high-quality materials also distinguish them. Benefit from our know-how, our decades of experience and our ability to customize our tangential fans specifically for your application.